Natural Selection Has Been Very Kind To Slugcat. Now You Need to Help. Look, I don't really know what kind of organism the main character of Rain World is. Who knows what bizarre experiments or breeding rituals brought him into being. Nevertheless, he/she/it is alive when nearly everything else is dead. So, y'know, points to him. Make sure he keeps living, won't you? Rain World's a game where the player is both predator and prey. The weird slug/cat hybrid creature can pick up spears and stones to ward off bigger animals but the most important weapon in his arsenal is the player's big ol' brain. 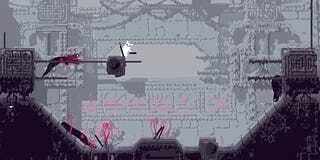 The animation in Rain World is something else, even when the game's hero is getting gobbled up by unsettling lizards. Especially when the game's hero is getting gobbled up by unsettling lizards. Take a look in the video below. Video editor Chris Person—you know the guy who does Highlight Reel—says it reminds him of Metroid and Oddworld. And the mix of platforming, puzzles and enemy evasion and manipulation makes me agree. You'll get to see how long you can keep a Slugcat alive later this year.